MERCEDES — Mauro Vasquez left a lasting memory in many people’s hearts. He died in his home at the age of 76 on Saturday. 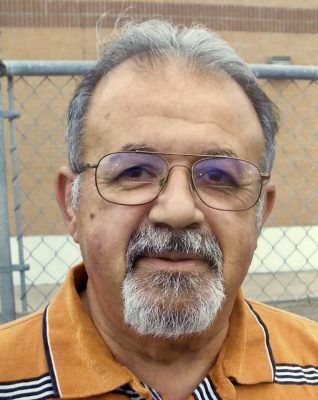 Vasquez worked for the Mercedes school district as athletic director, coach, teacher, junior high principal and high school principal for 25 years before retiring in 2004. During Vasquez’s term as high school principal, students and teachers earned three consecutive exemplary ratings from 2001 through 2003 from the Texas Education Agency. His former student Jesse Contreras from the class of 1985 remembers Vasquez as an awesome person who was fierce, passionate, a mentor and a friend to all his students. Vasquez was an enforcer of the district’s dress code, he held daily morning meetings with administrators, and applied disciplinary actions — such as prohibiting student athletes from participating in games if they were in in-school suspension. He said as adults they reflect, and see that Vasquez was right. “He was trying to make his students learn if you want to survive in this world you have to learn to follow the rules,” Howell said. A former student from the class of 1995, Dann Garcia said Vasquez was a passionate man dedicated to bettering the lives of students by creating structure, discipline and a safe learning environment for all. “His impact on the community has made a lasting impact, and his legacy will live on as one of Mercedes ISD’s greatest administrators,” Garcia said. Class of 2000 graduate Angela G. Morales remembers Vasquez’s daily morning words of wisdom. “He would yell, ‘no retreat, no surrender!’ through the halls every morning,” Morales recalled. She said Vasquez was her principal from junior high through high school. Up until last week, Howell received text messages with words of wisdom from Vasquez every morning. He sat there waiting in the VA hospital Tuesday morning for a text message from his old friend. But it never came as he sat waiting to see the doctor. Vasquez and Howell became neighbors and then became friends in the 70s. “I will not only miss him,” Howell said as his voice choked up with sadness. “But I miss his texts already.